Exploring ancient ruins is no trouble for Nathan Drake, but branding a PS3 is apparently much trickier. The latest game in the Uncharted series, Uncharted 3: Drake's Deception, is getting its own official PS3 bundle, so that anyone who doesn't have a PS3 and inexplicably wants the first game that he or she owns for the platform to be the third in an ongoing series can get their wish. 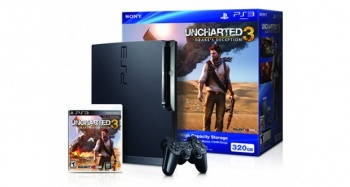 The bundle contains a PS3 console with a 320GB hard drive, a copy of Uncharted 3, one controller, and a month's subscription to Sony's premium PSN service, PlayStation Plus. It doesn't look like the PS3 carries any special Uncharted 3 branding though, unlike similar Xbox 360 bundles for Gears of War 3 and Modern Warfare 3. It seems a little odd that Sony hasn't at least included the official Uncharted 3 Dualshock 3 in the box, although having actually seen the pad, that's probably a mercy. The bundle will cost a $299.99, which really isn't a bad price; a PS3 with half the size usually costs $250. The bundle comes out on November 1st, the same day as the Uncharted 3 hits store shelves.